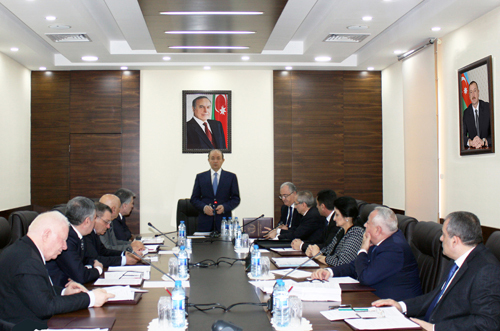 The next meeting of the Judicial-Legal Council was held. The last year s activities and the forthcoming tasks on improvement of the judicial activity were discussed at the meeting. Chairman of the Judicial-Legal Council, Minister of Justice Fikrat Mammadov noted that, the development course of great leader Heydar Aliyev was successfully developed by President Ilham Aliyev last year, stability and comprehensive progress is ensured in Azerbaijan, the economic potential of our state has increased, as well as by climbing 32 spots at World Bank Doing Business 2019 report our state ranks in the 25th place and is among 10 most reformist countries. It was noted that last year consistent measures were taken to improve judicial activity, increase the efficiency of justice and quality of work. Changes to the legislation for the purpose of application of the electronic court information system created under the instruction of the Head of State, provided conditions for the electronic document circulation, as well as the online submission of lawsuits, e-payment of court fees, electronic information on the case and decision-making, audio and video recording of court hearings. For this purpose, 60% of 111 existing courts were provided with modern ICTs, and measures are being taken to complete the work in this area. According to the legislative initiative of the President on humanization of the penal policy, including the decriminalization of some acts, documents on 6,000 prisoners were reviewed by the courts and satisfied. More than 4,200 people have been released from prison or their sentences were reduced. Electronic bracelets have been launched to increase the application of alternative punishment, and electronic bracelet were applied to more than 900 prisoners. Taking into account the importance of judges training, the training events organized jointly with the Academy of Justice have covered all the judges corps, distant trainings have been launched through video conferencing on the application of the European Convention and the case law with the participation of the judge and experienced experts. In order to create a modern judicial infrastructure in 2018, Baku city Binagadi and Zagatala district courts were built and provided with new modern ICTs within the framework of Projects with the World Bank and at the expense of the state budget. Construction of new administrative buildings is underway for Sumgayit Court Complex, Baku city Surakhani district, as well as Masalli District Courts. The opening of the new building of the Binagadi District Court by the President of the country was a manifestation of the attention and care of the judiciary. Our progressive reforms on increase of the effectiveness of justice have been praised by influential international institutions. At the same time, the activity of more than 80 judges whose term of office ended was evaluated by detailed and substantive analysis, 16 of them were prompted to courts of appeal and 61 were re-appointed for various positions. 30 vacancies in the higher courts have been fully complemented by judges with the necessary qualities, the vice-chairmen and board chairmen of the appellate courts has been appointed. As a result of the objective selection of judges, 108 lawyers have successfully completed their multidisciplinary exams, one-year trainings and trials at the courts, including Turkey and the European Court, and appointed by the head of state as the judges of various first instance courts. So, more than 70% of judges corps was formed with judges selected by new, progressive rules. As a result, the majority of the vacancies in the judicial system have been compiled. As a result of the legislative measures, the number of cases considered in the courts decreased up to 20%. At the same time, consideration of cases on orders execution outside the court electronically, specifying the duration of the court sessions appointment and limitation of postponing them by law, determination of simplified procedures in some categories from the current year will provide a solid basis for further reduction of workloads. All of this will serve to prevent cases of procrastination in courts, timely and quality consideration of the cases. At the meeting it was noted that, despite the measures taken, the shortcomings in the judicial activities, especially the corruption, procrastination and abuse cases have not been completely eliminated. Noting the commitment of the President on the care to the citizens, inadmissibility of corruption, ensuring integrity and transparency in all spheres, the Chairman of the Judicial-Legal Council emphasized upcoming tasks for the prevention of the circumstances causing damage to the judge s name and reputation. By drawing attention of high courts to such infrigements, the emphasis was placed on the increase of the principle approach towards such cases. Noting that more than 100 judges, including 22 judges of the Supreme Court, 38 appeals courts, and 42 judges of the first instance courts are expected to be evaluated in 2019, concrete tasks were given on raising demandiness, especially the sense of responsibility of the chairmen of the courts. It was noted that last year according to the legislation, for infringements causing citizens justifiable dissatisfaction 14 judges were suspended as the result of their activity were evaluated as unsatisfactory, as well as 4 court chairmen switched to a lower position, 6 judges were brought to disciplinary responsibility, 2 were dismissed, 1 judge s term was terminated early. Generally, since 2005 functioning of the Council, more than 250 disciplinary proceedings have been launched against judges, 122 judges were removed from the judicial system on various grounds provided by law, including 14 as result of disciplinary proceedings, 74 persons for expiration of term and 34 persons for reaching the age limit. At the end of last year, wide-ranging consultations were held in the capital and regions with the participation of all chairmen and judges, measures to improve the efficiency of justice, the existing problems in judicial activities, the shortcomings and the reasons for them have been thoroughly analyzed, the inadmissibility of cases leading to corruption has been emphasized. Speaking at the meeting of the Judicial-Legal Council, Ramiz Rzayev, the Chairman of the Supreme Court, emphasized that the key tasks of the head of the state on toughening the fight against corruption and strengthening control is a road map for improving the judicial activity, emphasized the importance of additional mechanisms in this area and the importance of forming a common practice of judicial practice and said that it was necessary to make serious conclusions from the violations. Also, for gross violation of legislation requirements, procrastination and other deficiencies chairman of Shabran District Court Chingiz Iskenderov, judge of Garadagh District Court of Baku Teymur Gurbanov, judge of Guba District Court Ilgar Mammadov, judge of Absheron District Court Sevinj Guliyeva, judge of Mingachevir City Court Alakbar Huseynov and judge of Khachmaz District Court Vladimir Ruvinov were reprimanded, the judge of the Absheron District Court Vagif Hasanov was rebuted, disciplinary proceedings against several judges have been initiated in the Judicial-Legal Council. Decisions were made on premature termination of term of Judge of Sumgayit City Court Ilyas Mahmudov, dismissal and transfer to another job of the judge of the Kapaz District Court of Ganja city Yashar Hashimov for gross violations of the legislation and for offences conductive corruption, as well as to send materials to the General Prosecutor s Office for Combating Corruption to investigate concrete facts about corruption.